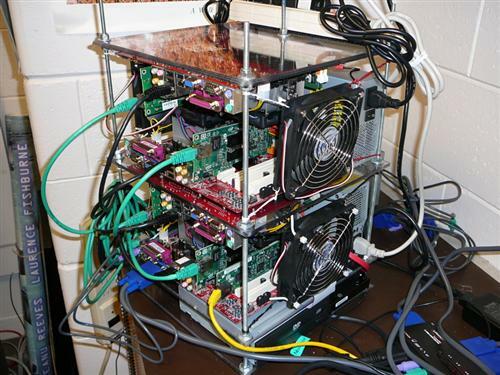 $1256 Microwulf Supercomputer Smaller Than Bread Box, Runs At 26.25 Gigaflops | OhGizmo! Do you ever suffer from computer-related performance anxiety? If so, you’re definitely not alone, and Calvin College student Tim Brom has the cure: a built-from-scratch 26.25 gigaflops supercomputer that runs off one standard wall outlet, will fit on your desk, and cost less than $2500 to build in 2006 (building a copy today would cost only $1256). The supercomputer, called Microwulf, consists of four microATX motherboards, each with a dual core CPU and 2 gigs of ram, all connected with an 8-port Gigabit Ethernet switch. The whole shebang also includes a CD/DVD drive and a 250 gb HD, and runs Ubuntu Linux. Microwulf’s price to performance ratio, as well as its performance to power ratio, is thought to be among the best on the planet, and it’s certainly more portable than any other supercomputer out there. Microwulf isn’t for sale, but if you want to try to build your own, there’s a complete hardware manifest on the Microwulf website, and ClusterMonkey has a fairly comprehensive article on the design and construction process. Good luck; if you can make it work I’ll buy one from you. You need to put something common of a known size in the pictures, to give a better understanding of size,volume and scale. Unique, innovative, and just plain cool. Keep up the good work. I see something of common known size in the photo: RJ45 connectors, Monitor connector, motherboards (w/ports) and power supplies. I think I even see a power strip on the top of the box. All in all, I think the dimensions of this computer are about 2 feet wide, 2 feet deep and 2.5 – 3 feet tall. VERY INTERESTING! Has anyone actully run an application on this computer other than LINPAK? RSVP if so. Would there be any way to run other applications on this thing and still be able to use the power of all the networked boards or would you only be able to use apps designed to work on something like this?